We have recently acquired many tonnes of spares which is being added to our already considerable inventory of items that we offer for sale. Amongst the stock we have acquired are hundreds of specialist weapon tools and gauges ranging from the early 1900’s up to the present day. 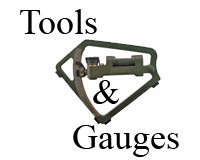 We hope to offer many of these rare specialist gauges and armourers tools for sale through our web site along with some of our more modern weapon tools and gauges that we manufacture within our factory.